Nasogastric (NG) and nasojejunal (NJ) tubes are often temporary tubes that run through a patient’s nose and terminate either in the stomach (NG) or the small intestine (NJ). They are used in many different occasions. Many times, a premature baby will get a feeding tube until he or she is able to take a bottle. Other times, infants, such as Avery and Eithene, will get an NG or NJ tube prior to getting a more permanent tube like those discussed below. When Avery was having difficulties aspirating (breathing in) his feeds as an infant, he was given an NG tube to keep his lungs safe. Eithene, on the other hand, had multiple birth defects (known as VACTERL association) and needed an NJ tube to bypass her stomach. 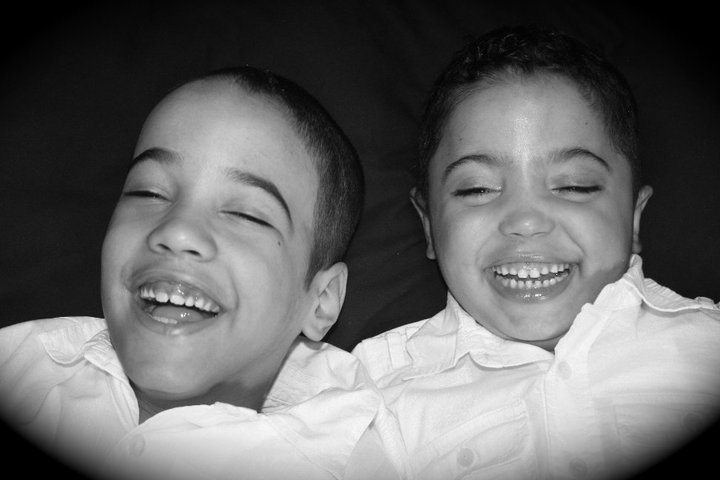 Eventually, both Avery and Eithene had their temporary nasal tubes replaced with permanent tubes. NG and NJ tubes are also used in older children and adults as temporary measures. Some might need them placed following surgery or during acute illness. When I had mine NJ tube placed last December, we thought it would be a temporary thing just to get over the acute episode of cyclic vomiting. I’ve also had friends and family members need them following flare-ups of (and subsequent surgeries due to) Crohn’s Disease. Although it too can be reversed, the Gastric Tube (or G-tube) is a more permanent solution than the NG tube. The Gastric tube is used in children and adults who are Failure to Thrive (FTT), who have difficulty swallowing or aspirating, or who need to “vent” (as discussed yesterday) his or her stomach. 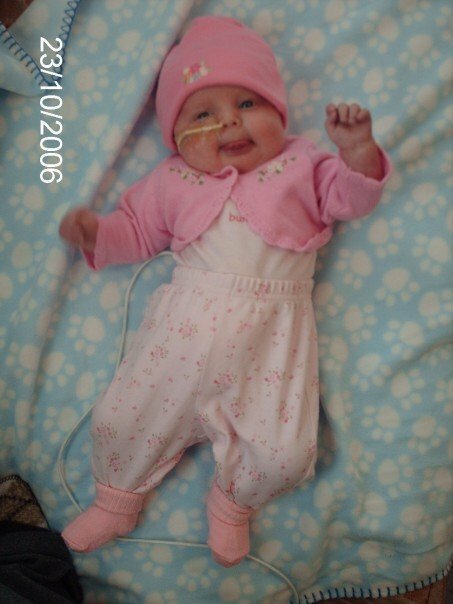 Jaden, for instance, had severe malnutrition and dehydration due to gastroparesis, dysmotility, and MELAS (a form of mitochondrial disease). Since she got her G-tube, she is now able to take food, fluids, and medications without getting as sick. 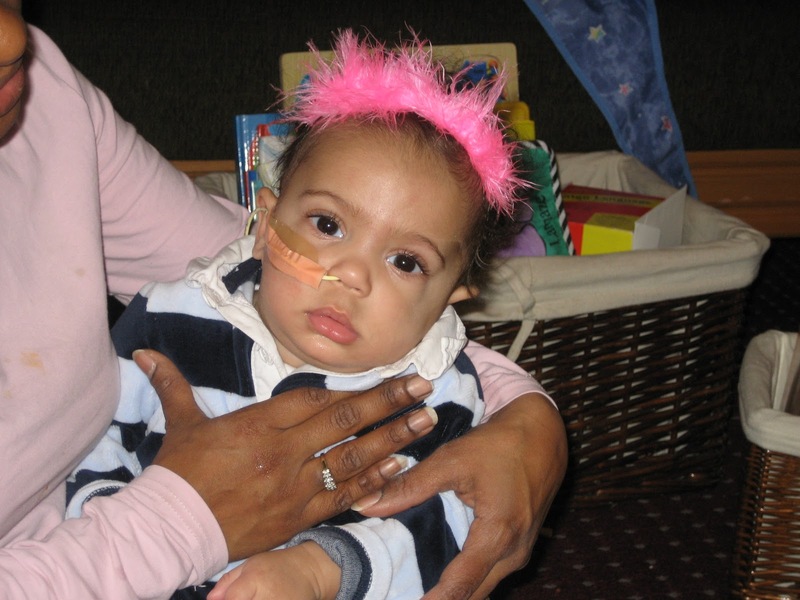 Isaiah, Avery’s brother, required a G-tube at 9 months old due to FTT, caused by mitochondrial disease. Although he frequently aspirates as well, Isaiah has been able to grow and thrive with his G-tube. Matthew has his G-tube for another reason. Due to Matthew’s severe Chronic Intestinal Pseudo-obstruction, his stomach was becoming severely distended on a nightly basis. His G-tube, which he got when he was 2 years old, allowed him to vent his stomach, releasing the air that was causing him to become distended. 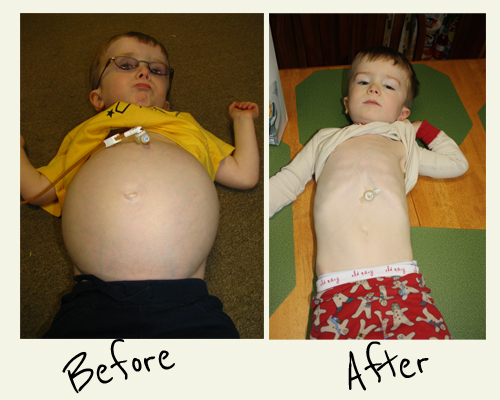 Although this helped immensely, he recently underwent a ileostomy to further decrease the distension. Because he is still small for his age, his family is still trying to find him a tube-feeding formula that will allow him to gain weight; unfortunately, all of his feeding trials so far have not been tolerated. Unfortunately, sometimes the stomach just doesn’t work. A Jejunal Tube (or J-Tube) is used when the patient cannot tolerate feeds into the stomach. This can be due to many different problems, such as gastroparesis and gastroesophageal reflux disease (GERD). Sarah is a young adult who was unable to tolerate oral feeds due to severe gastroparesis secondary to a mitochondrial disease. Recently, she underwent surgery to have a J-tube placed. She no longer suffers from the malnutrition and dehydration she once had and was able to return to school at MIT. Some patients – like me – need the benefit of BOTH a gastric and jejunal tube. Some individuals have a separate G-tube and a J-tube; others have a GJ-tube. These tubes have two attachments: one that runs to the stomach and the other that runs through to the small intestine (specifically, the jejunum). They allow an individual to have access to both areas to vent and/or feed. With the help of the G-tube to vent, some people are able to be 100% tube-fed through the jejunal port. 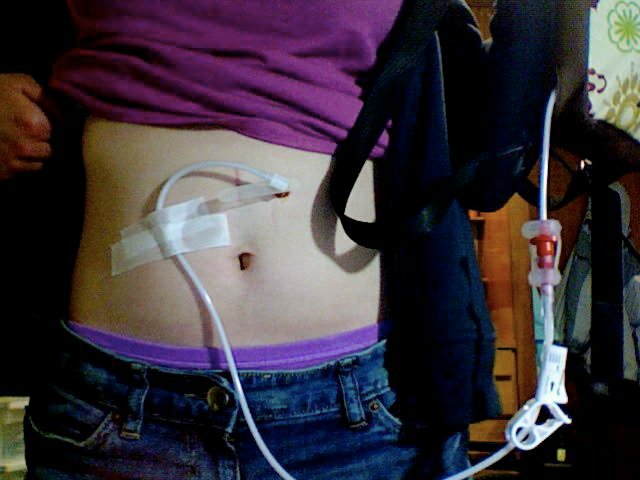 My GJ-tube allows me to vent my stomach while simultaneously receiving minimal fluids and medications through my jejunum. Like me, Avery, who now has a GJ-tube, can only tolerate minimal feeds and medications through his jejunum. Eithene can’t tolerate any feeds to either. She uses both of her tubes to vent continuously and only receives the absolute minimal amount of medication through her J-tube. So what happens when an individual – like me, Avery, and Eithene – can’t tolerate life-sustaining feeds through either the stomach or jejunum? This is where the central line and TPN come into play. TPN, or total parenteral nutrition, is a thick IV nutrition that allows one to get all his or her daily nutritional needs through an intravenously. Because it’s so thick, however, it can’t be administered through a peripheral IV; instead, it requires a central line. A central line is thicker than a peripheral IV and travels directly to the heart. 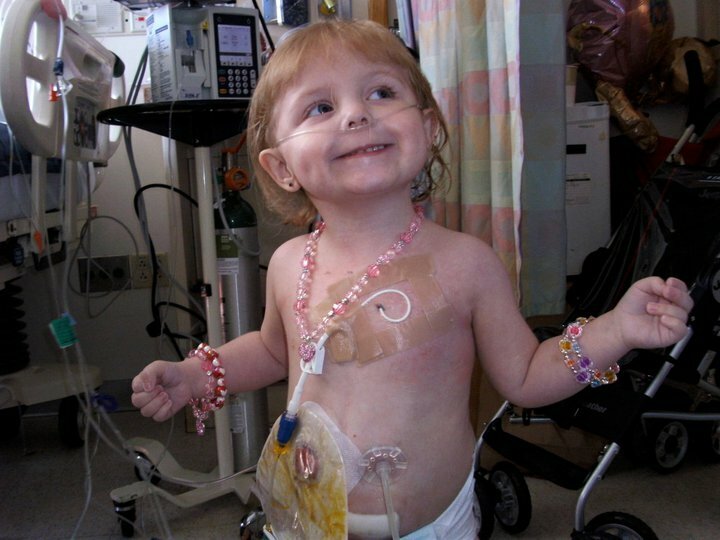 I have a PICC line which is inserted in my arm and runs to my heart; Eithene, on the other hand, has a Broviac central line which – like a few other types of central lines – was surgically inserted in her chest. You can check out Eithene showing of all her tubies below. I’m certain I overlooked some things, but I’m hoping this at least gives you all an insight as to why feeding tubes are used (not just for feeding! ), who might have one, where they’re inserted, and when they’re used. If you have any additional notes to add, please feel free in the comments! Finally, I want to send out a HUGE “thank you” to all my amazing friends who shared their stories and gave me permission to use their pictures. I admire each of you for disproving the various stigmas attached to tubies! This is an awesome series on ‘tubies’ and I am so proud of you for putting this together to help those of us who don’t know a lot about them understand them better. Nice! Thanks for sharing – I just learned a ton! Wow! I am overwhelmed, intrigued, amazed, thankful (for tubies), proud (of you and Keith) and so much more! Love you, Chelsea! My name is Andrea and I have gastroparesis. I was wondering at what point should I consider getting a tube?